Auburn University alum Charlie Ping, project manager of IndyCar race operations for Pratt & Miller Engineering, is a member of a team that has won the Louis Schwitzer award. Presented by the Indiana Section of the Society of Automotive Engineers (SAE) and BorgWarner, a powertrain technologies company, the award recognizes individuals for innovation and engineering excellence in racing technology associated with the Indianapolis 500. 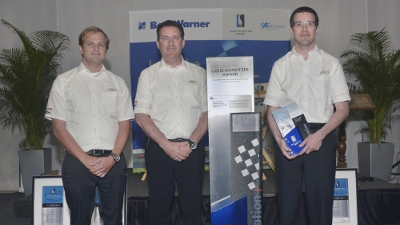 The Pratt & Miller team of Ping and Arron Melvin, chief aerodynamicist, worked in collaboration with Mark Kent, director of motorsports competition, and Christopher Berube, program manager, of Chevrolet Racing to develop a new aerodynamic design kit that allows each driver and team to balance downforce, drag, and engine performance. This enables teams to reach optimum levels of corner and straightaway speeds. No stranger to racing, Ping who graduated in 2004 in mechanical engineering, was captain of the Auburn University Formula SAE race team his senior year. He began working in professional motorsports in 2005, joining Honda Performance Development as an associate engineer. In his current position with Pratt & Miller, Ping serves as liaison between Chevrolet and Indy race teams and provides support for chassis development and engine-chassis integration. He is a member of the Auburn University Engineering Eagles Society and in 2014 he was honored as an Outstanding Young Auburn Engineer by the Auburn Alumni Engineering Council. The Indianapolis 500 this May made for a dramatic debut of the new aero package; Scott Dixon’s Target Chip Ganassi Chevrolet featuring the new aero kit won the pole and a Verizon Team Penske Chevrolet with the aero kit driven by Juan Pablo Montoya won the race. In fact, Chevrolets sporting the new aero kit swept the first three and eight of the top ten finishes. Established in 1967, the award honors Louis Schwitzer, an automotive pioneer, engineer and professional race car driver. Schwitzer won the first auto race at the Indianapolis Motor Speedway in 1909. Winners receive a $10,000 cash prize and their names are added to a permanent trophy displayed in the Indianapolis Motor Speedway Museum.